Fans and collectors opening five packs of premium Topps brand cards at the Topps booth will receive a unique card of Tiger Town's finest ballplayer - Ivan Rodriguez. 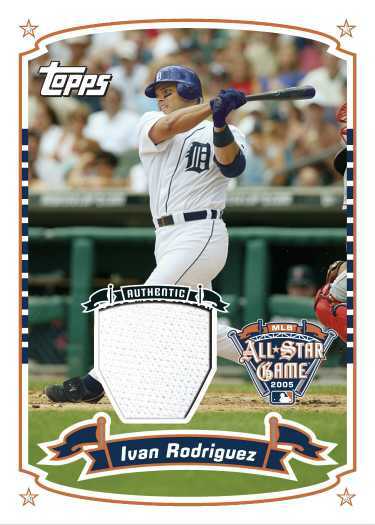 The FanFest exclusive Topps card includes an actual piece of Pudge's Detroit Tigers Jersey. Also available via redemption is a cool dual card featuring a Motor City legend and a legend in the making - Al Kaline & Ivan Rodriguez and a single card featuring one of baseball's most feared hitters - Alex Rodriguez of the New York Yankees. Fans and collectors can stop by the Topps Booth and purchase a unique 2005 Topps Baseball Complete Set featured in a commemorative Detroit Tigers box. As a bonus, the set includes five exclusive Tiger Prospects cards - Eulogio de la Cruz, Humberto Sanchez, Danny Zell, Kyle Sleeth and Curtis Granderson. 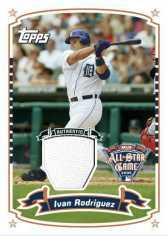 With each purchase of the 2005 Topps Complete Set (Tiger Edition), Topps will give collectors an additional 5-card set, produced just for 2005 All-Star FanFest. The special Tiger set includes favorites Kirk Gibson, Al Kaline, Ivan Rodriguez, Magglio Ordonez and Jeremy Bonderman.